Many thousands of people who have lost their lives to brain tumours were remembered as a minute’s silence was observed on 1 March to mark the beginning of national Brain Tumour Awareness Month. The tribute was led by the national charity Brain Tumour Research and saw scientists and researchers at its four Research Centres of Excellence, and people throughout the UK, pause to reflect on lives lost and to think of those battling the disease which kills more children and adults under the age of 40 than any other cancer, yet has received just 1% of the national spend on cancer research over the last decade. 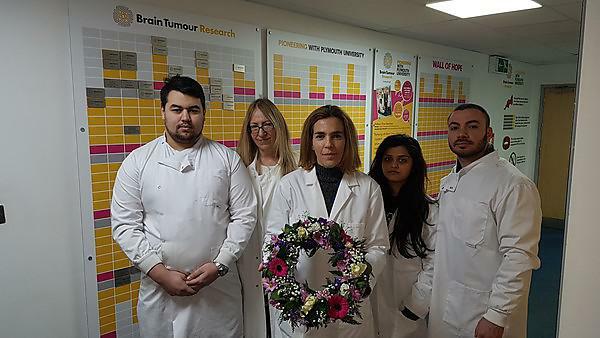 The Research Centre at the University of Plymouth fell silent when the charity’s research team, led by Dr Claudia Barros laid a wreath at the centre’s Wall of Hope, which provides a permanent tribute to loved ones. Floral tributes were kindly donated by Plymouth florist, Wendy Jordan. This tribute marks the start of Brain Tumour Awareness Month which culminates on Thursday 29 March with Wear A Hat Day. The charity would like people and organisations throughout the UK to join them on this day, hold an event and help fund the fight.